Anker E7 battery pack: 5 stars out of 5! The Anker E7 battery pack charges all the things, with plenty of power left to spare! Shown here with an LG G4, iPhone 6, and iPhone 4S for size comparison. Powerful and portable, this just-a-bit-bigger-than-pocket-size battery pack recharges your phone, tablet, camera, several times over. Typical use sees up to 10 full recharges for an iPhone 6 and 2 full recharges for an iPad Air. I didn’t realize how many uses I had for a portable Anker battery pack until I saw it in action. Holds a charge for a long time– take it camping! We’ve had our Anker for nearly a year now and it still gets a ton of use any time we travel or stalk Pokemon in the local park. It’s another thing to remember to bring along, and it only works if you remembered to charge it in advance. It’s sleek and small, but it’s got a fair bit of heft to it (the Anker pack weighs about a pound). I wouldn’t carry it in a purse, but it’d be unnoticeable in a backpack or carry-on luggage. Alas, its shiny black case will be a mottled canvas of fingerprints by the time you’re done fondling it for the first time. Which brings me to one final point about the Anker’s USB ports: they’re really stiff. You gotta push to get your USB cables plugged into this thing. Once I got used to it, I decided I liked it. The Anker plays for keeps with your USB cables, so there’s less chance of them falling or getting pulled out of the charger. The Astro E7 features a fully automated power on/off system. 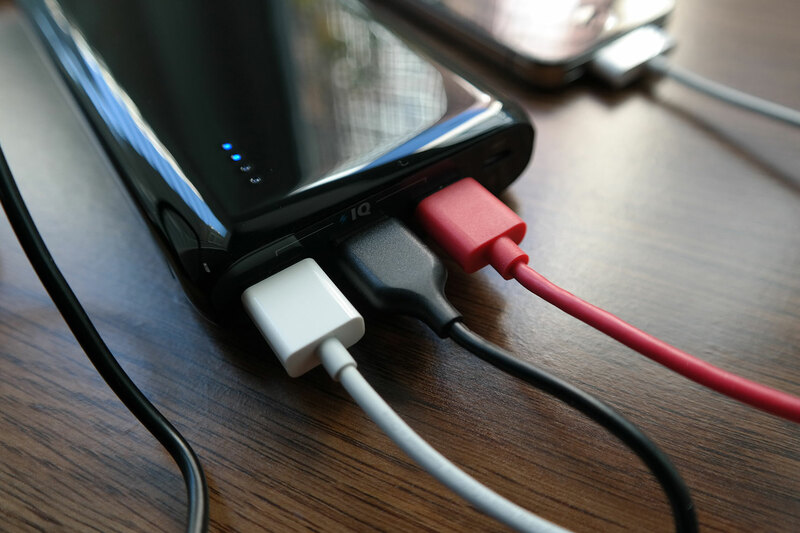 The Anker’s battery turns on when a USB plug is connected, and turns back off automatically when the last USB plug is removed (so you don’t have to manage it). 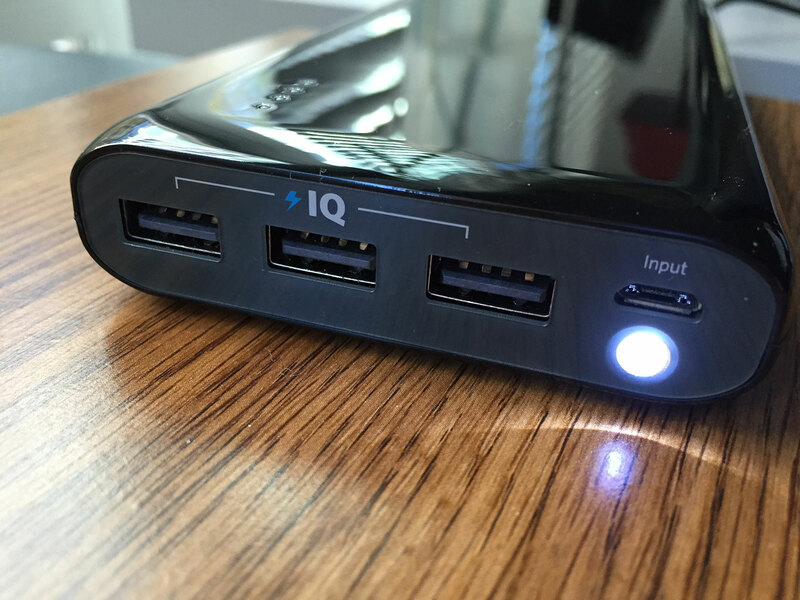 The IQ ports determine the maximum appropriate charging speed for a connected device and deliver charge at a safe speed for that device. Most battery packs just don’t have the capacity for charging multiple devices at once, but the Astro E7 has more than enough power to go around. As a group, the USB ports are capped at 4 Amps of total power output. A power-hungry device like the iPad charges at 2.1 Amps, but that leaves enough Amps left over to plug in another couple of phones and get full-speed charging for all three devices simultaneously. Charging my iPhone 6S and my friend’s LG G4 went at about a rate of 1% and .08% per minute, respectively, which is about the same we get when charging from our wall chargers. In both cases, our phones were doing other things, like browsing the web (the iPhone 6 test) and streaming Spotify (the LG G4 test). You might’ve noticed the battery pack has a 26,800 mAh capacity and the example device, the iPhone 6, has a 1,810mAh battery. So why does Anker say you only get 10 charges instead of 14.8 charges? That’s because, as with any battery pack, about 30% of the battery power is expended in heat and voltage conversion and powering the device itself. If you love your Anker as much as we love ours, you’ll be taking it lots of places. The Anker’s shiny body is prone to scratches and fingerprints, so we recommend getting a case for it. This hard-body travel case by Khanka is both cheap and great. Anker set the new standard for portable battery charger packs with the Astro E7. They’ll undoubtedly raise the bar again in the future, but for now, this is the battery pack to buy. Astro E7 is missing only a single thing: a wall power adapter like this one. (You can also buy the Anker E7 with a battery pack included.) 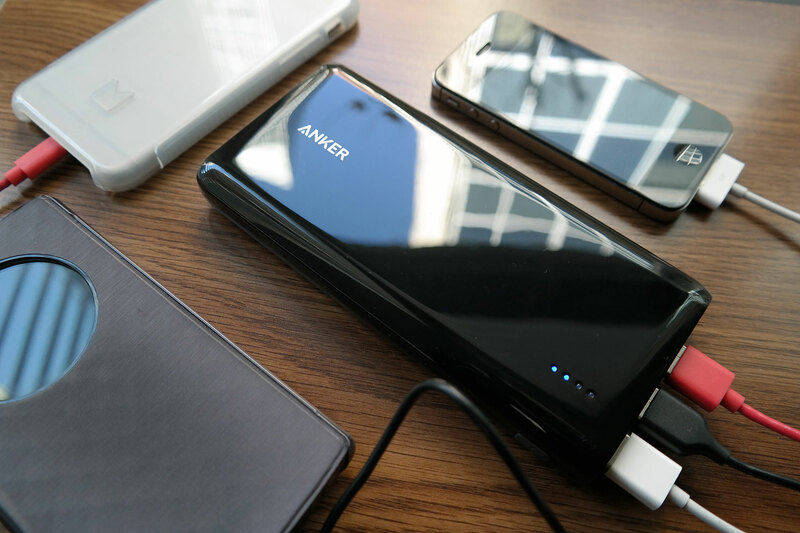 With an unbeatable battery size and the ability to charge up to 3 devices at once (and most or all of them at their fastest-possible charge speed), Anker Astro E7 is the current best choice in portable battery packs.